The weather in Minnesota is starting to get very Spring-like, which is odd for this time of year. Usually it’s still pretty cold but instead we’ve been able to get outside and play without jackets. I love that Spring is here and Easter is around the corner. 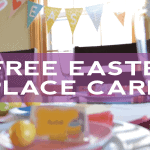 It’s time to share some Easter ideas! 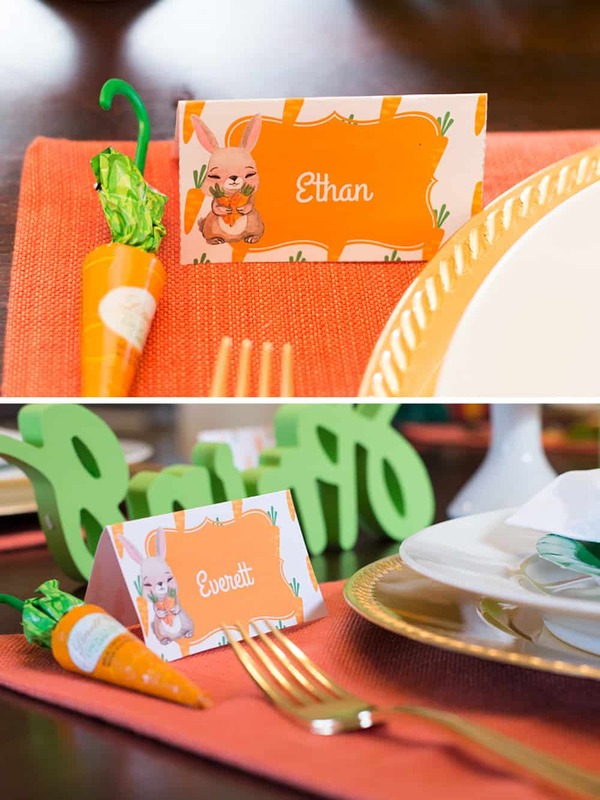 I was originally planning on using more traditional Easter pastels for my Easter table, including pulling out these free Easter place cards from last year to style my table. 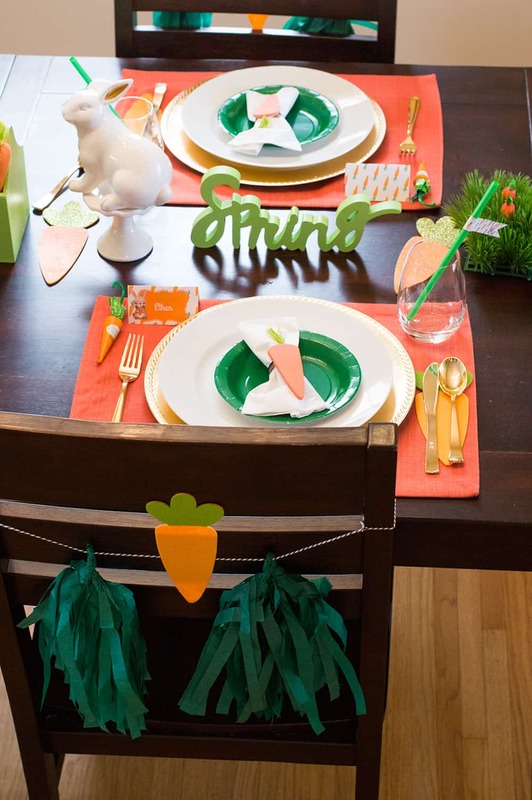 What ended up happening is I went to Target and found a ton of items in the Target Dollar Spot that inspired me to switch gears and try a Carrot Patch theme. I am so glad I did! First, I found the fabric carrots in the Target Dollar Spot and grabbed a coupled bunches. They come in a set of 3 and there’s at least 3 different variety of designs to choose from. I held myself at two! Then I found the green caddy and I knew it would work well to hold the carrots. I loved that it was already in my color scheme and so there was nothing to do to prep it. I stuffed the caddy with some gift shred filler and then stuck the little carrots in, 3 on each side. I’m certain I’ll find more uses for the caddy in the future. 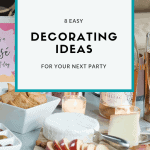 I love reusing party decorations over and over, to save both money and space in my house! I also picked up the sweetest little ceramic bunny, which I placed on a cupcake stand, also from Target, to give him a little height. 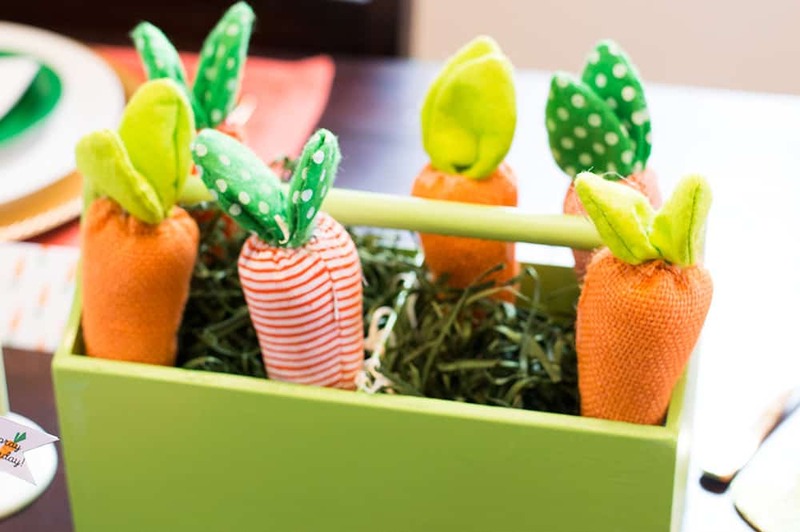 I wanted to add some more grass elements so I picked up two little grass pallets from Michaels, and stuck in these little paper carrots I found at Target. The carrots originally had little loops you could use to hang, but I cut those off. 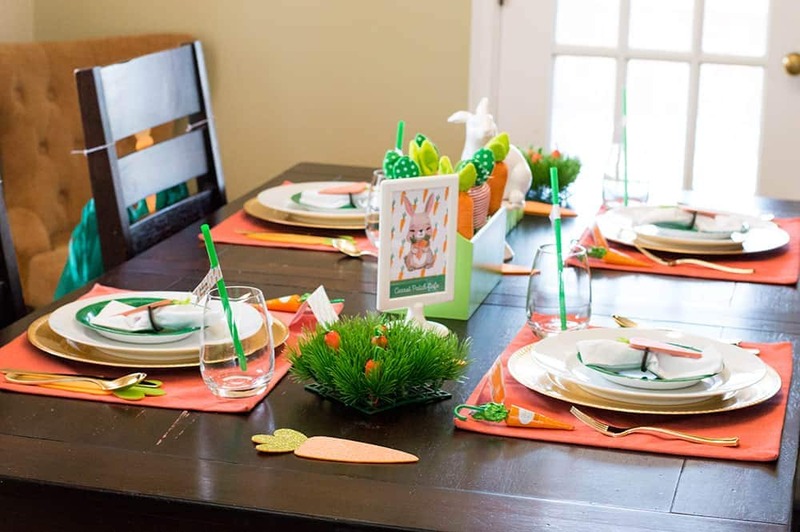 I also found some carrot cutouts in the Target dollar spot, some glittery and some not, that I used on the table. 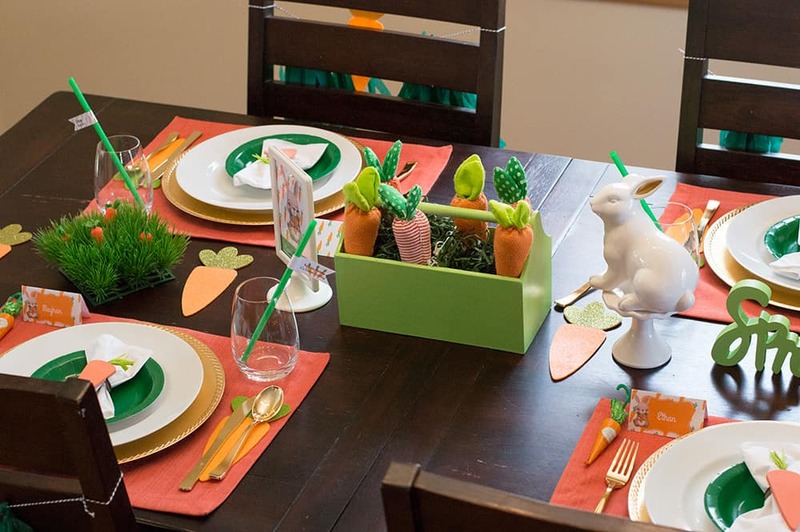 I placed a glittery carrot in between other decor items and used the rest on the chairs. I have never made my own tissue tassel buntings from scratch until now. I’ve always bought them fully assembled, or at least pre-cut and then I had to roll and twist them. While I am a huge fan of the fully assembled options to save on time (my favorite vendor is GlamFete), it actually wasn’t too difficult to make my own. I followed the tutorial from Andressa over at Twinkle Twinkle Little Party. She always has gorgeous tissue tassel buntings in her party setups so I know she’s a pro at making these. The tutorial was super easy to follow along, and I think mine turned out pretty great for being the first time. I made two tassels per chair, strung on bakers twine, and stuck a carrot cutout for the center. My kids think these are so fun, and they didn’t take a ton of time to put together. 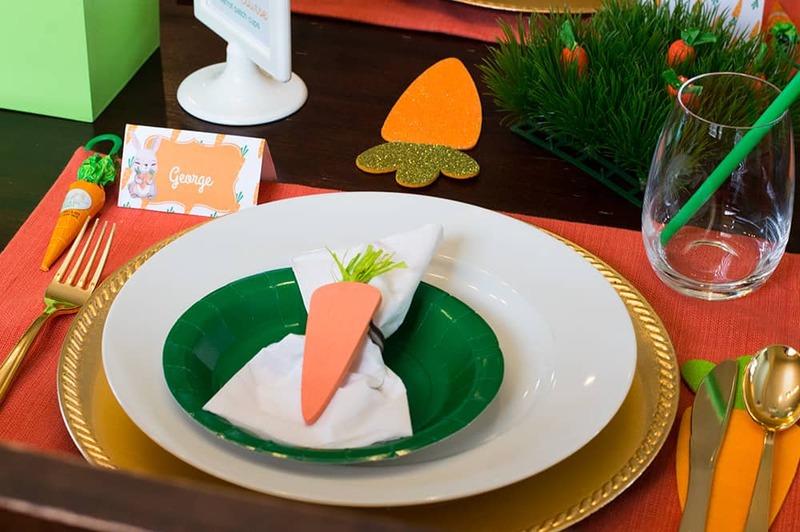 For the place settings, I started with an orange placemat from Target. They are the Threshold brand and are about $3.99 each. Then I placed down the gold chargers I picked up for my Lucky You St. Patrick’s Day Party. I layered my regular white dinner plate and a green paper plate (again leftover from St. Patrick’s Day). I also used the gold plastic utensils from that party too. I had extra carrot cutouts, so I slipped one under each knife and spoon. Those napkin rings were found in the Target dollar spot, and while super cute, they are definitely more form over function. I wanted to use some cloth napkins but the rings are wood and I found it too small to get the large cloth napkin in the ring. I stuck with white paper napkins. Each setting was personalized with a place card (more details in a bit) and topped off with a sweet little Lindt chocolate carrot umbrella. I didn’t notice until after all my photos were taken and I was in the editing process that somehow a spoon was not where it was supposed to be! Can you spot it? This is totally crushing my slightly OCD soul. As a graphic designer, it was a must that I included some custom party printables on my table. I had so much fun putting together the place cards, sign, and straw flags. I love how this 4×6″ sign turned out! On one side is the cute little bunny graphic. I love how he’s holding carrots. On the other side I have our Easter menu, which is totally customizable. I printed out on my home printer and stuck it in an IKEA frame. I love these versatile frames and they are so inexpensive. Each place setting was completed with a custom place card, as you saw above. I think it makes it extra special to assign seating, even if we are sitting in our usual places! 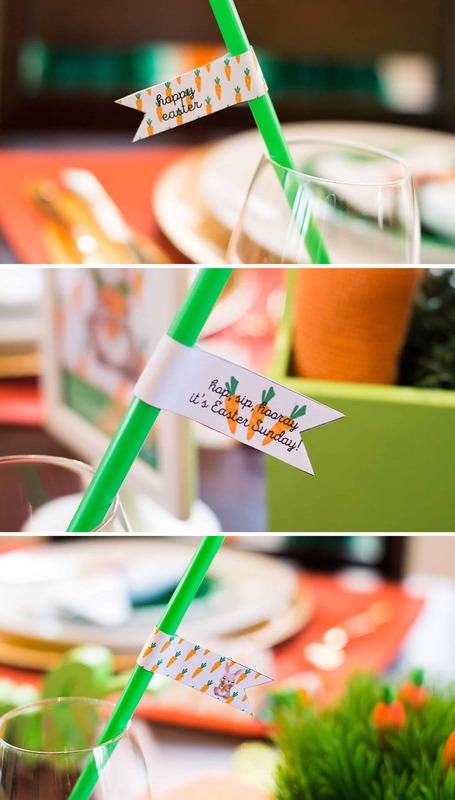 Straw flags are one of my favorite printable decor items to add to all my parties. They are so easy to put together and really dress up any drink. I have two versions available. I love how these turned out. Download these files for yourself! I loved how these printables turned out and I’m excited to offer these as free downloads for you! If you use these, I would love to see how you style them. Please tag me on Instagram (@elvamdesign) and use hashtag #elvamdesignstudio. You’ll be able to edit and add your own menu items and names using Adobe Reader and filling in the form fields or you can print and handwrite your info in. 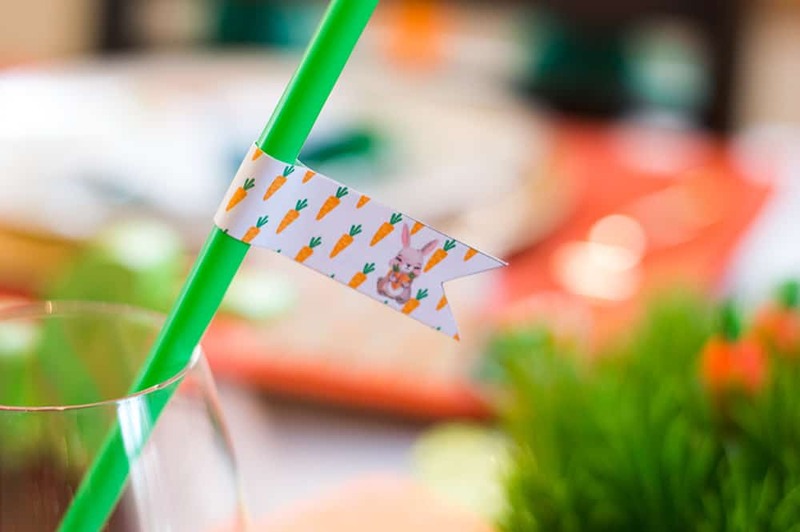 For the straw flags, print, cut out, and use an adhesive to wrap around the straw. You can also attach to toothpicks for cute little food flags. I’ve teamed up with 9 other bloggers who have put together a great selection of Easter ideas to celebrate with your family and friends. 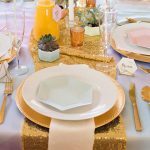 If you are coming from Style in the Details Girly Easter Brunch, “Welcome!” I’ve included links to all the blogs below so you can check them all out. 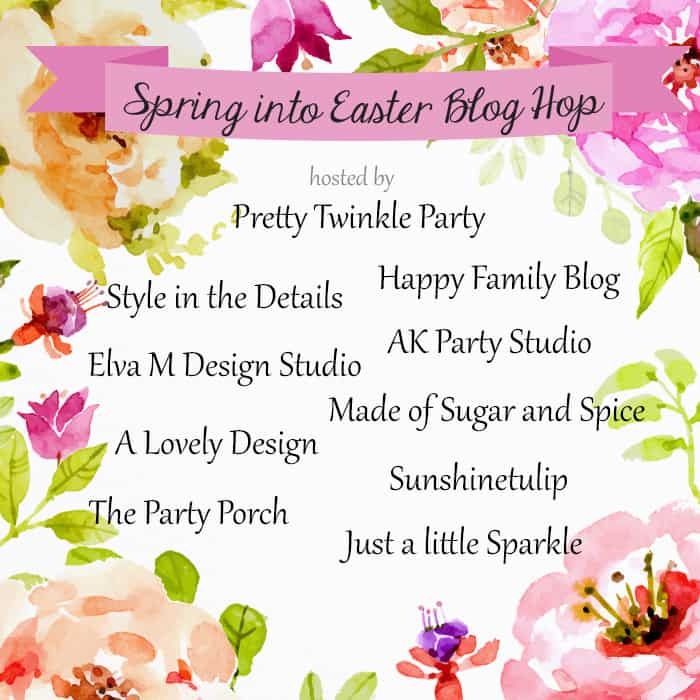 Hope you enjoyed this Spring into Easter Blog Hop and found lots of fun ideas to incorporate into your own home. 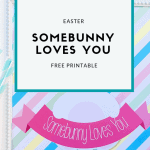 If you are looking for more fun Easter printables, you might like my free Somebunny Loves You 8×10″ sign or these free Easter place cards. OMG what a sweet setup. 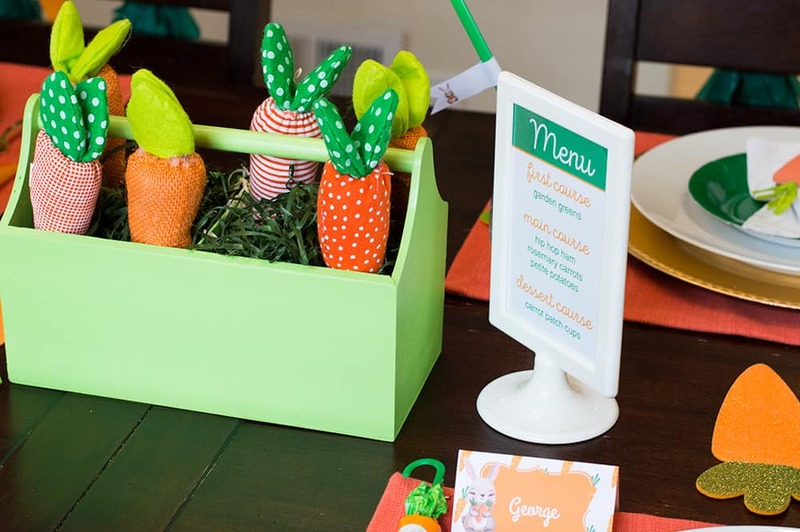 I love the pops of orange and your adorable printables. Thanks, Cristy! The printables were fun to put together, and I love the color scheme. SO stinking cute! 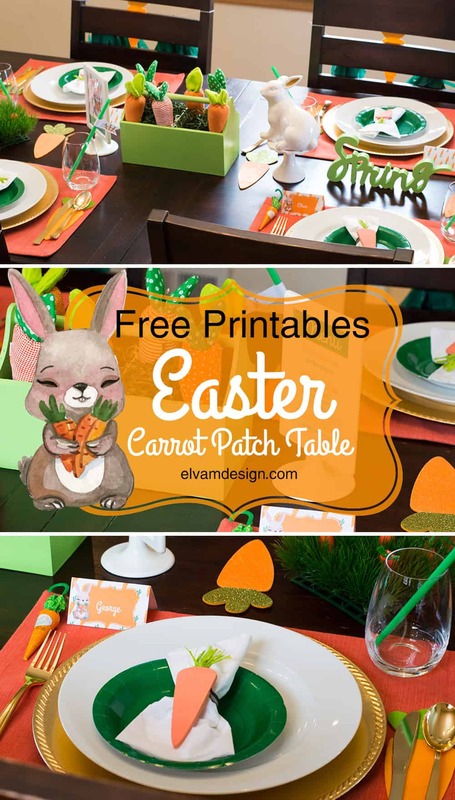 Love that sweet little bunny print! Thanks, Annaliese! The printables were so fun to create! Thank you for the sweet words, Holly! There are so many fun goodies at Target right now in this theme! Please share a picture of your brunch! So much cuteness in this post. 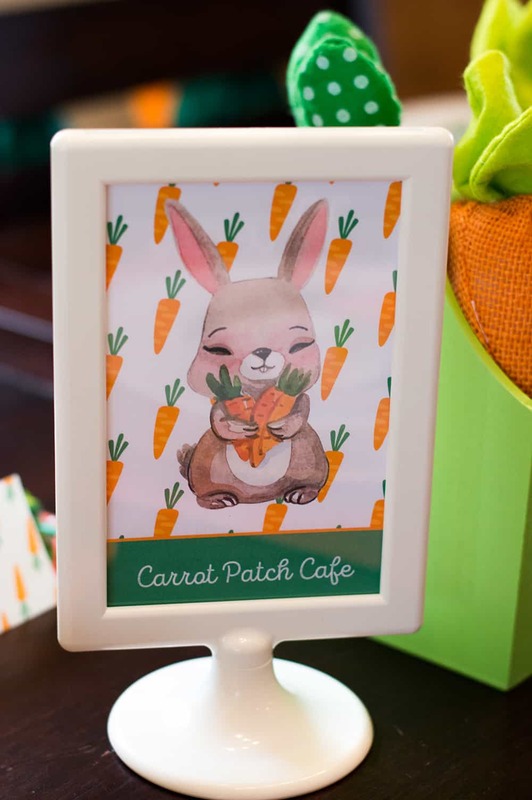 I love the Bunny Carrot Patch Café sign. You seriously create the best graphics. Adore the place setting. Love it all! Thanks so much, Goldie! So happy to be on this hop with you! Oh you outdid yourself Meghan!! So adorable and I love all the printables!! Yay!! Thanks so much, Lori! This was a fun table to put together and I enjoyed creating the printables. Just adorable Meghan! I just LOVE the little menu! Such a darling touch! Thanks! It was fun to put together. This was the first time I made something super editable so hopefully it works ok! 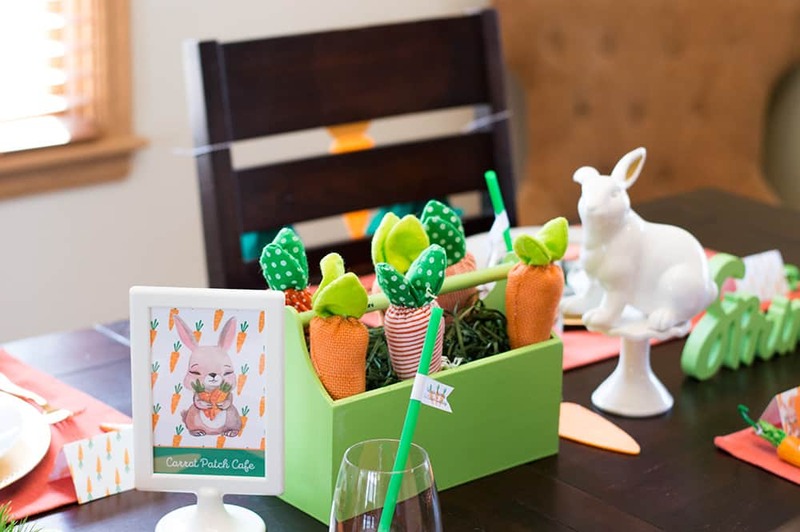 I love all of these Easter party ideas. So perfect for Spring! 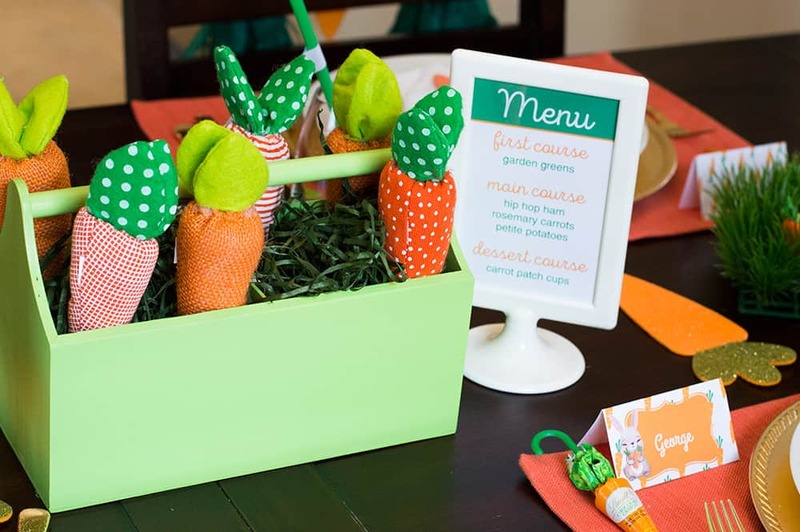 The Carrot Patch centerpiece is everything! Thanks, Michelle! 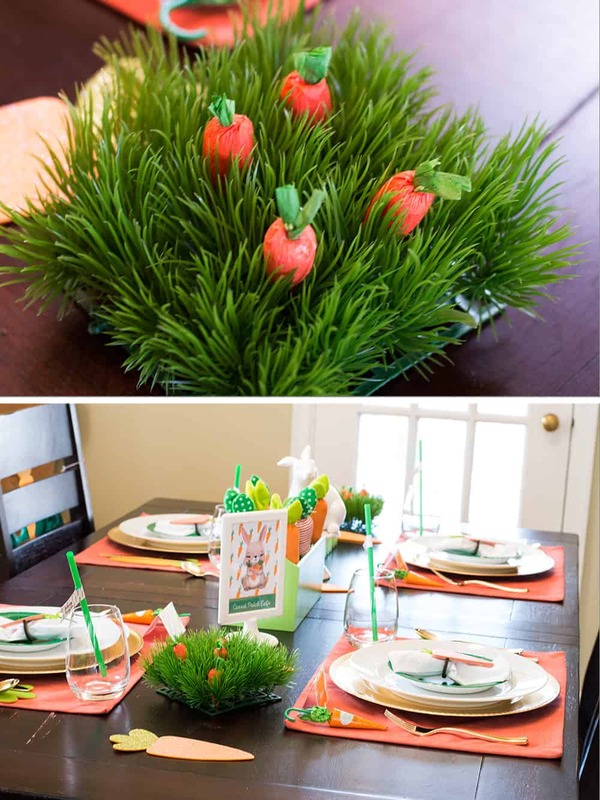 I loved the bright orange and green colors, especially that centerpiece! 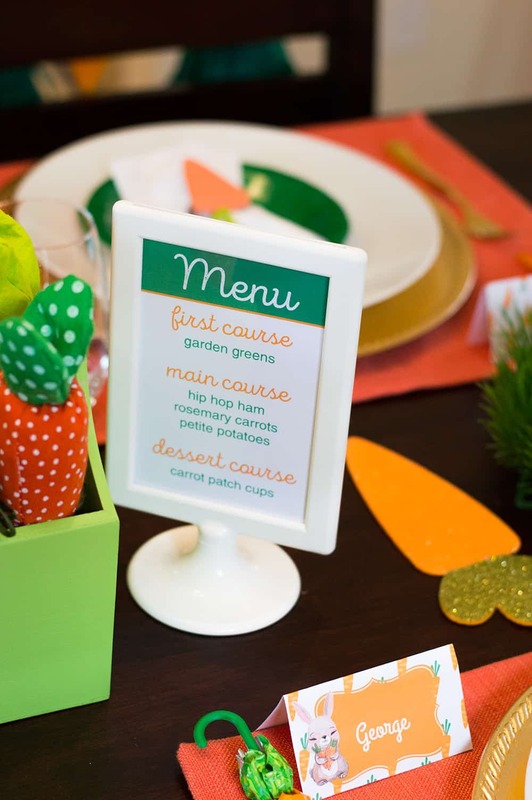 I love those printables and such a clever menu! Darling tablescape! I love this sweet set up! The colors are fabulous! I love to reuse decor as well! It’s fun! I love this cute and sweet carrot patch party Meghan! The printables you designed are so sweet! love that bunny! It’s all so cute! Love the printables.